Welcome to the ACS Colorguard web site ! The marching band season has come to a close and the winterguard season is upon us. The ACS Band and Guard finished well in KMEA Finals placing 10th in the 3A division. Congrats to all members! The winterguard season is now in full swing and the Axis Winterguard has also began with their show. The show for Axis this year is entitled "No Strings." For more details, visit the Axis Winterguard Website. 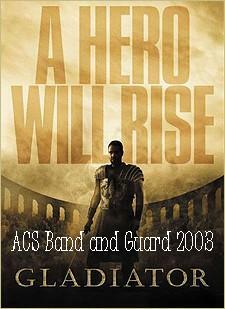 Please check back for details on the marching band show for the 2003 season! If you would like to see any changes or anything added to this site please feel free to send suggestions to me at my email address. Also if you have any pictures from last season or this season, please send them to me. Thanks. With the marching season over, winterguard is in full swing. Please visit the Axis Website. I would like to thank all the moms and dads, aunts and uncles, grandmas and grandpas, friend and family who came out to support the ACS Band and Guard this past year. You made us a success! Thank you! Check back later for more updates on the upcoming 2003 marching season.